Do we have any robot fans out there? I'm so excited to finally share these cute Robot Valentines with you!! 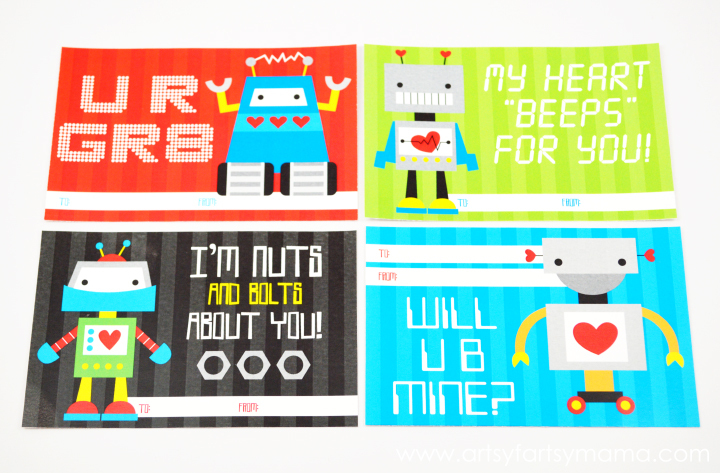 These robot Valentines will be fun for any child to hand out, and it's easy to add a treat or non-candy items (though they are totally fine to give out as-is)! All four Valentine designs are on one sheet in a single PDF. Print on cardstock for best results. These are so cute. Perfect for my robot obsessed step-son! How adorable is that!? Love it! Cool design! What?? You designed these adorable robot Valentines?? Nice!! Love them. These are so so cute! Pinned!